Children collect bullet shells off the streets of Sur district, on December 30, 2015 in the mainly Kurdish city of Diyarbakir, after a curfew was partially lifted. 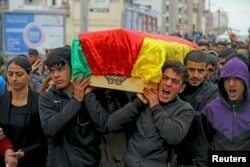 Turkey’s military says it has killed 307 Kurdish separatists in recent weeks in counter-terrorism operations in southeastern Turkey, but the toll has also been great on civilians. Rights groups say 162 civilians, including 32 children, have been killed since August in districts where the military has imposed 24-hour curfews. Rights group Amnesty International has urged Turkish authorities to lift indefinite 24-hour curfews that have been in effect since mid-December in the Sur district of Diyarbakir province and the towns of Cizre and Silopi in Sırnak province, as well as intermittent curfews on other mainly Kurdish towns. “The body of 56-year-old Taybet Inan, who was shot by a sniper on December 19 was left in the street for seven days as his family was unable to retrieve it,” Amnesty reported Tuesday. In addition to severe electricity, water and food shortages in curfew areas, residents have been unable to safely leave their neighborhoods to access healthcare and, Amnesty says, ambulances have been denied entry by security forces. 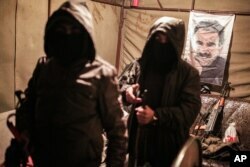 Armed clashes have continued between the outlawed Kurdistan Workers’ Party (PKK) and security forces in urban areas in southeastern provinces of Turkey since the breakdown of a peace process between the party and the Turkish government in July 2015 after three years of negotiations and a fragile cease-fire. A resident in Diyarbakir painted a grim picture to VOA of life under the curfews. The mother-of-one asked not to be identified for fear of retaliation from security forces. “You can be killed while you are having breakfast with your kids at home or when you want to leave a house that’s been shelled,” she said by phone. “The white flag doesn’t change anything, that is how a 12-year-old was killed two weeks ago. A young man was killed when he was taking his brother to hospital,” she added. “Why does the West remain silent when Kurds are being killed?” she asked. Both sides in the intensifying struggle trade accusations of abuses and both criticize the West. The Kurds are critical of what they say is a lack of forthright condemnation from Western governments for the tactics being used by the Turkish military. The Turkish government denounces the West when some charges are leveled, mainly from NGOs and rights groups, against security operations. Turkish officials say the Kurdistan Workers’ Party has no interest in talking and has caused the violence in the Kurdish southeast by declaring self-rule areas and erecting barricades, digging trenches and planting explosives to keep authorities away. Kurdish separatists complain Western governments turn a blind eye to egregious Turkish military behavior because they need the Turks to curb refugee flows into Europe and to support the international coalition against Islamic State militants in Syria. “Turkey’s southeast has transformed into a war zone, with intermittent curfews in a dozen towns,” says Merve Tahiroglu, an analyst with the Foundation for the Defense of Democracies. “Buildings are destroyed and civilians are being killed because of the conflict. Pictures are increasingly resembling scenes from Syria,” she says. The Kurds' complaint has been taken up by more than 1,200 local and international academics, who on Monday issued a short collective statement calling on the Turkish government to halt security operations in mainly Kurdish southeastern Anatolia and to resume talks. Turkey’s president, Recep Tayyip Erdogan, rebuked the signatories, calling them “ignorant.” Speaking to a conference of Turkish ambassadors, he insisted rights violations are being committed by terrorists, not the state. “Hey, you so-called intellectuals! You are not enlightened persons, you are dark. You are nothing like intellectuals. You are ignorant and dark,” he added. Apparently taking the presidential cue, Turkey’s Supreme Education Board says it is planning to take legal action against local teachers who signed the petition, which also attracted the support of international luminaries Noam Chomsky, David Harway and Immanuel Wallerstein.